Visit any public boat ramp in the Washington, D.C.-area during duck season, and you will find a hodgepodge of characters seeking the Potomac's bluebill-rich waters. There's an eccentric mix of historic duck hunting families and transplants, brought here by career or political fortune. There are weekend warriors and diehards, big boats trailered to big trucks, and small boats towed by yuppie mobiles. One tie binds them all: retrievers, specifically the Labrador. But the river is large enough, unforgiving enough — and close enough to The Bay — that Chessies also enjoy a strong following. What a scene it created on the 2008 goose opener when a springer spaniel — gasp — bounded out of the front seat of my truck. Heads turned as Freedom merrily bounced about greeting passersby as no self-respecting Lab would dare. As I grabbed my blind duffle, I felt the stares of onlookers: Who would bring a springer on a goose hunt? My dog didn't seem to notice and I didn't much care. I won't argue a springer's single-layer coat isn't fit to handle ice-laden waters. And, if you contend Labs take hand signals better on impossibly far blind retrieves, well, you've got me there too. But there's no animal I'd rather spend a day with. Springers are happy, with big smiling brown eyes. They cherish every day afield, though are susceptible to over-excitement when ducks drop in. When it comes to tracking cripples of any kind, I place the springer on a higher pedestal than any breed recognized by the American Kennel Club. But I'm admittedly biased. The point is, for some, the list of capable duck dogs includes only the Lab or, for the especially patient, the Chesapeake. However, there are those of us who've found — or were found by — "other" duck dogs. Breeds that just plain suit us. Their qualities exude what we enjoy about a day afield and in a sense mirror our own waterfowling souls. For centuries in continental Europe, hunting dogs were a luxury reserved for society's upper crust. However, in the mid-19th century German hunting laws were amended, opening the door to working-class sportsmen. These men couldn't afford a large fleet of specialized dogs. They needed one, do-it-all hunter to chase birds and hares, retrieve on land and water, and even blood-trail big game. According to the North American Versatile Hunting Dog Association, the resulting "versatile pointing breeds" arose in the late 1800s. The breeds gained rapid popularity and by the mid-1900s were well established in North American circles. The German shorthaired pointer has found particular favor in the U.S. (according to AKC statistics, it was the fifteenth most popular breed in 2012). I had never considered shorthairs a duck dog, but a recent trip to Argentina changed my opinion. The GSPs were well mannered and retrieved with enthusiasm, flash and accuracy. However, as the name implies, the breed's key disadvantage on waterfowl is its thin coat. Even in Argentina, they wore thick vests, and on one frosty morning I noticed some shivering. Perhaps that's one reason two lesser-known versatile breeds are gaining quiet popularity among duck hunters in colder climates: the Pudelpointer and wirehaired pointing griffon. Their key advantage over the shorthair is a dense, wiry, protective coat. 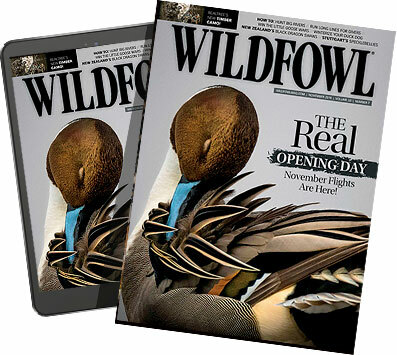 They are most popular, of course, with hunters who also pursue upland game, but the griffon in particular may offer advantages to the dedicated waterfowler — even over the Lab and Chessie. "I was a Lab guy for 25 years, but I found myself looking for something different," says Captain Bob Wetherald of Mid River Guide Service in Newburg, Md. "My wife and I wanted a good dog for the house, one that didn't shed like a Lab or require constant bathing to make them smell nice — which you shouldn't do during duck season anyway. That's when I came across a griffon at a hunting show in Easton, Maryland." Wetherald was struck by the dog's pleasant disposition and the owner's tales of versatility and toughness. And, unlike Labs, griffons shed very little and lack the oily scent. Soon he bought a female, Sandy. "She's proven to me that the griffon is absolutely a duck dog," he reports. "Griffons have a base coat and an outer coat called a wirehair, which gives them durability to the extreme — as much as a Lab, if you ask me. They also have webbed feet which makes them great swimmers, and Sandy is quickly developing into as a good a retriever as any Lab I've owned. "For me, doing what I do — hunting the Potomac, plus a little upland hunting — this is as close as I can come to owning a dog that can hunt with me every day in every situation." Like Wetherald, Ryan Crew of Trussville, Ala., spent more than two decades certain the Labrador was the only breed for him. But then Crew joined a friend in Florida for an old fashioned buggy-style quail hunt. Pointers quested for coveys, but what really grabbed Crew's attention were the English cocker spaniels retrieving downed birds. "I just couldn't get over these little balls of energy running out and picking up quail," he said. "It's a long story, but I ended up with one, and he changed everything I thought dogs were capable of. The English cockers are so intelligent it's as if they're human. You just look at them and they seem to know what you want. And if you get them in the area of a crippled duck, they're typically going to find it. I've seen some Labs with great noses, but I don't know I've seen one with the nose of a spaniel." Crew recalls one slow, miserably wet morning of hunting with his cocker, Trip, when a lone drake pintail buzzed the decoys. Crew's shot connected, but it sailed out of the muddy field. "I was mad at myself," Crew said. "I could barely walk because of all the mud and sheet water, and now we had a crippled pintail that I wasn't even sure had come down. But I lined Trip up, and he ran a couple hundred yards and went into a big, thick irrigation ditch. Three or four minutes went by, and my black-and-white dog emerged so covered in mud he looked like a Boykin. But he had the pintail. With every step, he sunk almost to his stomach. That's just one of many ducks I wouldn't have gotten back without that dog." Spaniels shine in the upland, have less susceptibility to heat than retrievers (think September teal or dove hunting) and fit nicely into smaller boats. "We hunt out of a small boat and kayaks almost exclusively, and a 35-pound cocker or small springer is easier to manage and doesn't leave us cramped for space like a 90-pound retriever," Crew said. "Plus, when they shake it doesn't wet the boat from bow to stern." Such space considerations factored strongly into the development of the Boykin, which stands just 14 to 18 inches at the shoulder and weighs 20-40 pounds. Bred in South Carolina, the small dog was ideal for those hoping to reach the state's numerous shallow backwaters. Today the Boykin remains a great retriever, and through careful breeding efforts, I believe it's perhaps the most underrated upland spaniel. The spaniels' big disadvantage is in their tolerance for icy water. Unlike Labs and Chessies, they do not have a warm double coat or oily, hollow hair. Some retrievers shed water like rain off a duck; springers soak it up like a sponge. So, I employ properly-fitting neoprene vests and towel them off after retrieves. But late-season duck hunting often means a quick hunt or leaving the springers home altogether. "They're not for everyone," Crew said. "If you intend to hunt ducks 60 days per year regardless of the weather and want a dog that can haul in dozens of geese across a wheat field, I think the Lab is head-and-shoulders your best choice. But here in Alabama, we rarely break ice. I can't imagine a better duck dog for my situation or a better pet when I'm not hunting." An exception to weather-sensitive spaniels is the less common American water spaniel. It is only slightly larger than the Boykin and similar in appearance, save its less-docked tail and warm, curly double coat. This is a breed developed specifically for duck hunting that's serviceable in the uplands — not the other way around. Good breeders can be challenging to find, and American water spaniels don't retrieve ducks with the speed and stamina of a Lab, but, for many they are the ultimate compromise between retriever and spaniel. Many of the previously mentioned dogs are suited to guys who split their time between waterfowl and upland. There are, however, two pointing breeds worth noting for the avid upland hunter who enjoys shooting a few ducks prior to the freeze: the French Brittany and its descendant, the American Brittany. Personally, I think any dog can be taught to retrieve to some degree, but Brittanys have the natural instinct and intelligence to do it on a fairly high level. Many have also suggested they're one of the most easily trained breeds — the Brittany is a dog for both the rookie or seasoned pro. "All my dogs retrieve, otherwise it'd be like hunting with a three-legged dog," said Bill Dillon, whose Plum Creek Kennels in Armour, S.D., turns out some of the country's best French Brits. "I'm not into fighting over which breed is best — I think that creates too much division in our ranks — but the Lab's conformation has always been as a retriever. The French Brittany's main function in life is as an upland dog, but when it comes to water retrieves they've always gotten it done for me as well." While Dillon is primarily an upland bird hunter, he has sold dogs to duck hunters. And, because he hunts pheasants in the Prairie Pothole Region, he figures his dogs complete about six water retrieves per hunt. "They're not strong enough to bust ice like a Chessie, but they're great with kids and other dogs," Dillon said. "They're also smaller — 40 pounds or less — which suits them to smaller boats." Rich Louter tends to create a small scene when he competes in retriever hunt tests with one of his poodles. "When a poodle comes to the line, all eyes are on him," said Louter, who trained Uncle Si's poodle for an episode of A&E's "Duck Dynasty." "The dog has to do a good job, or people will say, 'I told you that poodle couldn't hunt.' There's a misconception poodles are frou-frou dogs, but with proper training and breeding they have a lot of heart." "One of the primary reasons I got my first poodle was because my step-daughter has allergies. The breed grew on me from there," Louter said. The downside to the poodle's wiry, hypoallergenic coat is it offers only a single layer of protection. "Cold is a concern," Louter said. "They're lean dogs. On a cold day with wind, you have to keep an eye on them. They're probably not the best choice for big water or rivers, but for rice fields or flooded timber they're perfect." As you may suspect, the poodle's personality is a bit daintier than the Chesapeake's. Expect a more cautious entry into the water, and be sure to exercise patience and care in training. "They're a thinking breed, so you have to think quickly, too," Louter said. "They tend to hold a grudge, so if you get on them too much in training, they remember it for a while." But make no mistake, the poodle's original role (it was likely bred in France) was as a waterfowl retriever. In fact, most breed historians trace its name to the German word pudel, meaning "one who plays in the water." According to Vickie Lamb's excellent Hunting Dog Reference Book, the poodle is also an ancestor of more venerable duck dogs such as the curly-coated retriever. "I just love their versatility," Louter said. "You can hunt ducks in the morning and they'll tear it up flushing pheasants in the afternoon."